E-bird is an online program of the Cornell Lab of Ornithology and the Audubon Society, that enables bird-watchers to upload checklists real-time. E-bird today is not just a platform for sharing bird checklists and reporting sightings, but also a global community of birdwatchers. 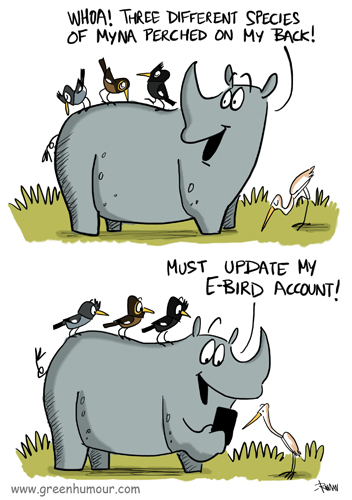 If Indian Rhinos had E-bird accounts, they'd be full of sightings of rare grassland birds that are so difficult to track! Here's one for my fellow E-birders from my weekend column with The Hindu BLink.